“HAPPY NEW YEAR”!! We greet total strangers with this familiar greeting, even if don’t really care and will never check to see how it goes. It is a traditional greeting, usually made with very little real concern or depth. I really do wish you a happy new year. I hope it will be a year of celebration, growth, and meaning. I know there will be some tough times and situations, but I really do want your 2018 to be a happy year. Of course, a wish is just a wish, not a plan. I believe God wants you to be happy, but the reality is that in many ways, the choice to be happy is up to you. No one ever has the job of making you happy, not even God. In fact, if you don’t chose to be happy, you simply won’t be. If you chase after the wrong things trying to be happy, you will only end up tired and confused. Jesus repeatedly talked about God wanting to bless you (blessed = “happy”), but He always explained how He does that. Any other plan will fail sooner or later. 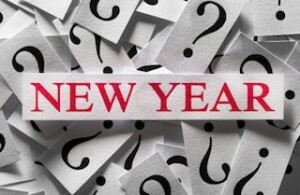 So how do you decide and plan to have a happy new year? Just sitting around, asking Him to bless you is not going to accomplish much, if anything. Faith is always an intentional act of trust. Here are some suggestions for trusting Him so He can bless you. Jesus told us not to worry about tomorrow. He explained that tomorrow will have enough challenges of its own. (Matt. 6) One of the biggest destroyers of happiness is focusing on tomorrow and its potential problems or yesterday and it’s damages. It is one thing to look at what you expect tomorrow and do what you can to get ready for it, but another to let it steal today from you. If there is nothing you can do today to actually make tomorrow easier, the more time and energy you spend thinking about it the less happiness you will experience. You have probably heard the phrase “following Jesus”. That is the picture we need to understand. Following means He goes first, so He knows the way. Following also means we have to take it step at a time and at His pace. Running ahead is simply dangerous. When it comes to happiness, you are the biggest challenge you face! Have you ever seen the picture of a guy leading a donkey by dangling carrots hanging on a stick in front of it? The donkey keeps walking toward the goal, pulling the load along because he is sure he can get them and will be happy. If the donkey ever realizes the trick, the game is up. The carrots will be things that most people think will make them “happy”. It may look very appetizing and make a lot of sense, but if it is all about you, it may be nothing but a carrot. Our humanity, our culture, and our enemy try to set to set you up to chase the wrong things, convincing you that “if only. . “ then you would be happy. These carrots promise you happiness, but are really distractions from what God has designed you to be. There is a reason Jesus said that to follow Him required denying yourself! (Matt. 6:24) You cannot chase the carrots and Jesus. The danger of chasing “carrots” is that even if you get them, they can easily be taken away. Wealth can be lost, accomplishments outdated, relationships broken, and beauty faded. The things we often chase the most, are temporary. In short, we are blessed when we are more concerned about what others get out of it than what we get out of it. God isn’t interested in serving you, but He does want to bless you for truly serving Him! Jesus never accepted simply agreeing with His principles. He said the tree is known by what it produces. Real faith produces actions (James). Real happiness requires going beyond the understanding and acceptance of the principles into living them out. Jesus didn’t say we were blessed by understanding His words, but that we would be blessed “if you do them” (John 13:12-17). So I really do hope you will have a “Happy New Year” by trusting Jesus enough that through the good and the bad, you will actively live out His teachings each day!